Your Mac or iOS device isn’t going to do much of anything if its network connection is slow. If that connection is over WiFi and it isn’t working exactly the way you want it to, it’s time to troubleshoot your setup. 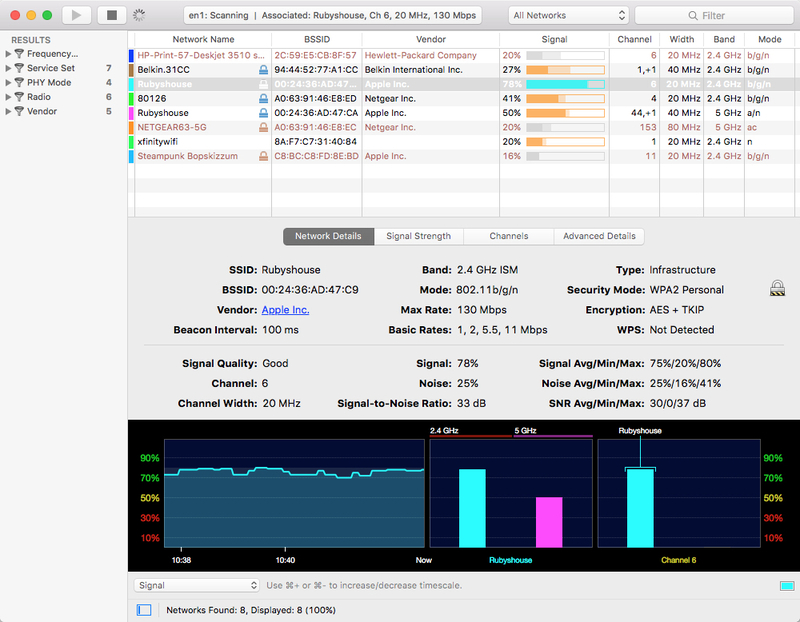 WiFi Explorer (US$14.99) is a powerful Mac tool that can get your WiFi network operating at peak efficiency. The app is compatible with all versions of OS X from 10.7 (Lion) to 10.11 (El Capitan), and uses a large and continuously updated vendor information database to identify WiFi routers in the near vicinity. As a default, WiFi Explorer displays a grid showing (for all nearby routers) network names, BSSIDs (the MAC address of the router), the device vendor (Apple, Linksys, etc…), signal strength, channel(s) being used, channel width, the band the router is on (2.4 or 5 GHz), and the modes in which it operates (802.11 a/b/g/n/ac). A large number of other network attributes can be added to those columns through the WiFi Explorer preferences. Click on any of the device names at the top of the WiFi Explorer window, and it’s possible to view the signal strength not only at the current time, but over time in a linear view. You’re also able to see what other devices are on the same WiFi channel, which might be a prompt to select a different, less utilized channel. WiFi Explorer would have been quite the tool to have had when I was a Mac consultant, since I was forced to use a lot of trial-and-error methods to troubleshoot network problems instead of having a powerful tool like this. In my limited testing in my home office, I was able to see the difference that moving my old Apple AirPort Extreme about a foot had on signal strength — the average went up about 3 percent. While not a huge improvement, it did demonstrate how important router placement can be. WiFi Explorer is lacking one key piece, though — it would be nice to have access to a how-to guide showing how WiFi Explorer could be used in network troubleshooting. Especially for novices, having information about WiFi channel conflicts, signal strength and overlaps, and how to determine what changes to make to the router setup to improve performance would be very useful. Any Mac professionals who must perform WiFi network troubleshooting regularly should have WiFi Explorer in their toolkit. Even for regular Mac users, though, the app is perfect for helping you fine-tune your home or office network or perhaps persuade your boss (or spouse) that you need a new router.